When you click on Browse in the menu, you will see the dictionary in an alphabetical format. This shows the dictionary ordered by the vernacular alphabet letters and allows you to see a whole letter section of the dictionary at a time. 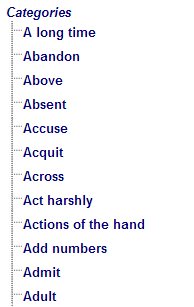 This shows lists of glossing language words that have definitions in the dictionary. These lists are ordered by the glossing language alphabet letters. You can click on words in the glossing language lists to see the corresponding vernacular words in the dictionary. This shows the dictionary ordered by Semantic Domains (Categories of meaning) and allows you to see all the vernacular words that fall within a particular category. The domains are sorted in a hierarchy or by name on the left of the screen. You can easily expand the hierarchy by clicking on the + signs to find words in an area of meaning. Some parts of the dictionary displayed are links. If you hover your mouse over a word and it turns into a pointed finger, then you can click on that word and the dictionary will jump to the word you have clicked on.